Bar Poker Open » BPO Site Is Live! The *NEW* Bar Poker Open Site is now live for the first time with a TON of exciting features that will only add more fun, and more excitement to our community online! Things have changed a bit, so please make sure to read this document to avoid confusion. Aside from just the Weekly Qualifiers, there will be play money ring games, sit n go tournaments, play money tournaments, heads up tables, and much more coming! Play directly in your browser, no downloads or apps required. Learn the software and challenge fellow bar league players using 200 play money chips before/during/after playing in the tournaments! Sit N Go’s, Ring Games, Heads Up Matches, are all at your disposal with play money. 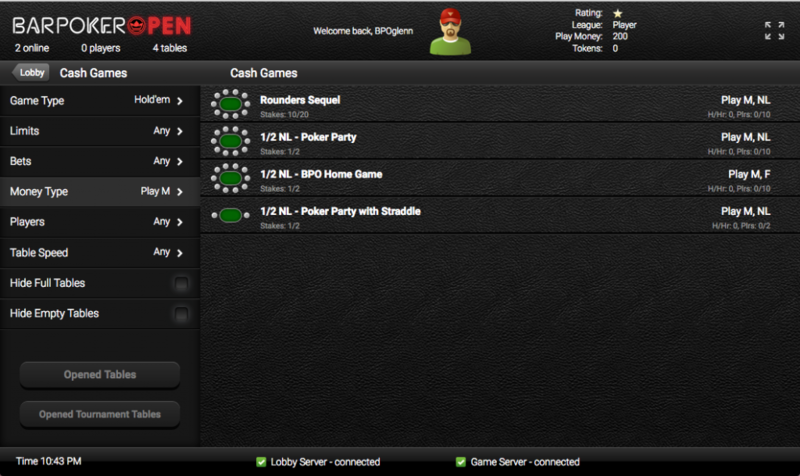 We built a fully functional poker site within 30 days. Even though we are live, there are some “nice to have” features that have not yet been finished. At the base of this article is a full list of features we plan to have added. BPO and this site is always improving and evolving, so we also appreciate other feedback from players after their experience. We also invite player feedback, because we now have the ability to tweak and customize this software much more than our last. When building the software, we created this in HTML5 and in a “mobile first” design because a very large percentage of our players were using their phones or tablets. The design is clean, simple, and easy to navigate and can be used on a phone, computer, or tablet. The poker site uses a lot of data and a decent amount of system resources, so we have found most players to have the best experience on a phone that is less than 2 years old or a computer and you only try to access with a strong WiFi Signal, do not use 3G/4G. Try to use a computer that is 5 Years old or newer with a strong and stable connection. 3G/4G Cell signals are not recommended because of their inconsistency and slow speed. Mobile Device – All devices are supported. Your best experience will still be on a Newer Computer with a strong network connection. If you want to use a phone, test it on the play money games ahead of time. Do not use a 3G/4G Data Connection for any poker site. A phone data connection is not stable and can often disconnect. We have experienced no issues with mobile devices 2 years old or newer. Browser – All browsers are supported on our software. We recommend Google Chrome for this site and browsing in general. Microsoft Internet Explorer / Edge we have found to have problems on our site or websites in general. They are terrible browsers. This is different as before. If you Log Out by accident, or get disconnected, you must go back through your player dashboard to log in! There are two types of currency in the software, play money and tokens. Play money games are for fun and you only win play money. 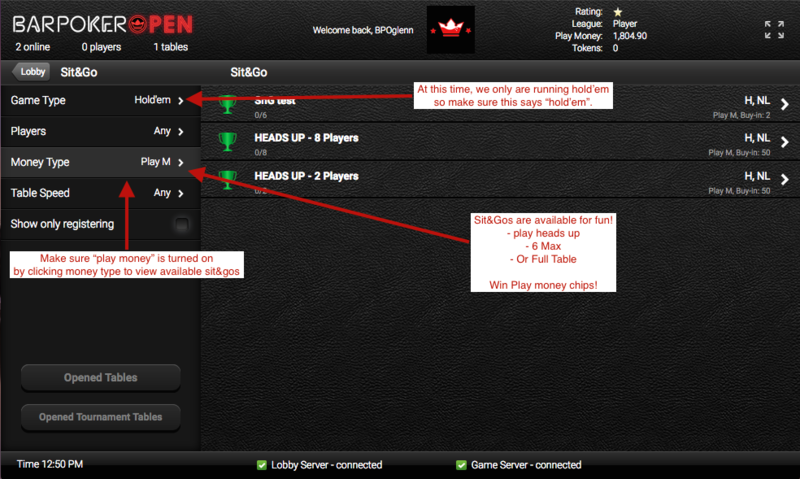 We will have cash games, sit n gos, heads up challenges, and eventually scheduled tournaments available just for fun. Token games are where you win tokens or seats into our National Championship, or special events. Token games are the only way to win prizes and the only way to earn tokens is in the bars! 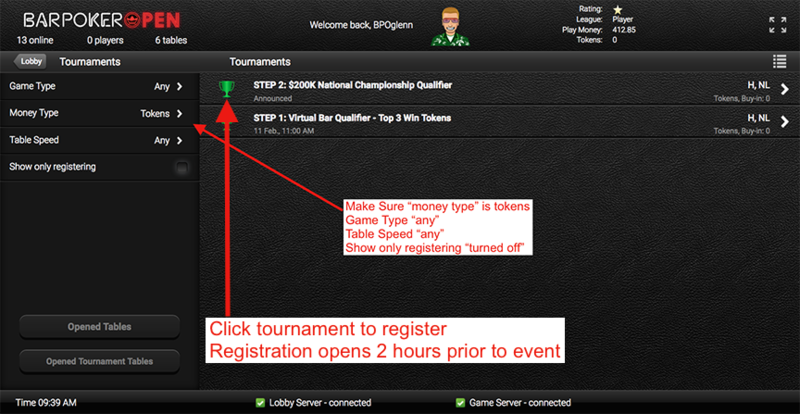 You can no longer register for a tournament in the BPO Dashboard. 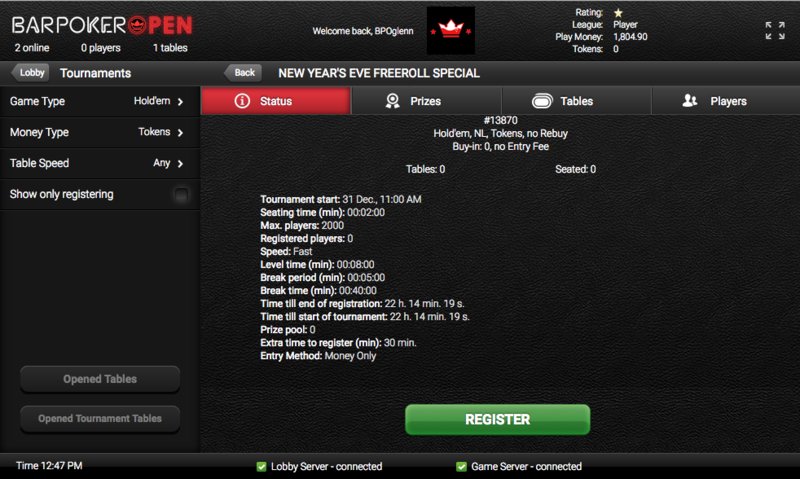 You will have to click the “Access Poker Site” button and then find the tournament you are looking for. Do not click the Play Now Button, that is a shortcut that is not live yet. When you go to “Ring Games” or “Sit N Gos” you can practice playing on the site against others. The best time to do this is the morning prior to our qualifiers. “Step 1 : Virtual Bar” tournaments are a virtual version of the BPO Sanctioned bar games but against our entire Bar Poker Open Community! These are a great way to compete against fellow league players and get comfortable on the software. “Step 2 : $200K National Championship Qualifiers” are weekly only championships with a ton of prizes on the line! Once come in the Top 3 at your local bar hosting our events, you get a “token” to participate in these games. Tokens do not expire, so use them when you are ready. Usually held on Sundays, First Place wins a Vegas Package and Approximately the Top 5% Win A Seat To the $200,000 National Championship. After winning a seat, players are still welcome to play for the First Place Vegas Package but do not win “more seats”. – Players that win Multiple Vegas Packages can win $400 spending money for each additional “First Place”. Players that win 10 Seats from July 3 – May 14 will win a full Vegas Package from us. If it is your second package, we will give you $400 spending money in Vegas. More Features Coming as well as we elaborate further on your online experience! Please report any issues or comments to qualify@barpokeropen.com. That is by far, the most reliable and fastest way to get a rapid response during tournaments. Do not post in the comments section here, comments are not monitored. Thank you again for being a part of this incredible poker community, enjoy the games and see you all in Vegas! If you have won a seat can you sell it, or give it away, or use it for a future tournament? Won seats cannot be sold or transferred to another event. Tokens to not expire, so keep your tokens for another event that you can plan. DO NOT play in the online qualifier, if you cannot use your seat because it essentially takes a seat from someone that can participate and would have earned it. The rebuy is the worst thing you could have done. Promotes the most stupid play around. Played for over an hour and half, got sucked out twice by same idiot and there is still 215 players left. I have 16 tokens left and I doubt I’ll ever use them to play here again. Rebuy tournament is only a “Week 1 Special” to give a big boost in seats for the first weekend and have a huge seat guarantee. Everything went back to normal on Week 2, with only a single rebuy allowed. I am playing in a qualifier game right now but I won the token from the current league that I play with and not the one that it states Kontenders. I play for Steel City Poker and I want my representation to be with that league! I think we did this for you already, but we can do that if you email qualify@barpokeropen.com. Leagues are responsible for entering results. Once they do your ranking updates and token emails are immediately distributed. I would like to change my avatar but it will not let me… can you help? avatars can be changed by clicking on the “account” link that is the first page you see when you log in. I thought you cold register late on Saturdays, but it wouldn’t allow me to… how late do they allow you to enter a tournament…. I came to the tables at 75/100 blinds…. but couldn’t get in. late registration is usually 30 minutes on step 2 championship qualifiers. You can always view that on the tournament details to make sure. if you cant win a seat can you buy into the tournament? thanks !!!! This was answered via email, but for other players reference. The only way you can buy-into the $200K Championship on your own is if you are ranked high enough on your league’s Super League Leaderboard. You will see there how how you need to rank. I Have seat won [9-17-2017], room reserved, flight booked; how to know BPO has me “in”? If your player dashboard has you winning a seat, we have your seat won. There is also a status bar that says your qualification status and by the looks of things you not only won a seat but also the masters seat yesterday… congrats and see you in Vegas! Today, Mar 18, the deal cards were being turned over very slowly; twice my time for action started before I could see 2nd card! Also, how can I set/turn on additional time for action after 5-2 seconds? And, the fold button doesn’t hold if a raise occurs before action gets to me; If I want to fold after 1st look, it doesn’t get better w someone raising; this causes delay in game as I have left the table momentarily & system times me out wanting action I have already taken. Does this still hold for 2018? Apparel package was 2017, it is now the Masters Tournament. If playing in the May 26 on line game that you need two seats to play. Do you lose the seat if play and rebuys and add one ? If you have only 2 seats you will not have the ability to rebuy. 1 Seat = $200K Championship, 2 Seats = Masters Buy-in for second seat, 3 Seats = Rebuy/Add-On for Masters, 4 Seats = Another Rebuy/Addon, ect. This means you probably have a filter turned on that should not be on. Make sure filters on the left is set to “game type -> any” “Money Type – tokens”, “table speed – any”, and finally make sure “show only registering” is NOT checked. While in a tournament, either for tokens or seats, how can we check on the number of players remaining? This stat can substantially alter our play. while you at table view there is an “i” you can click with that information as well as much more information! 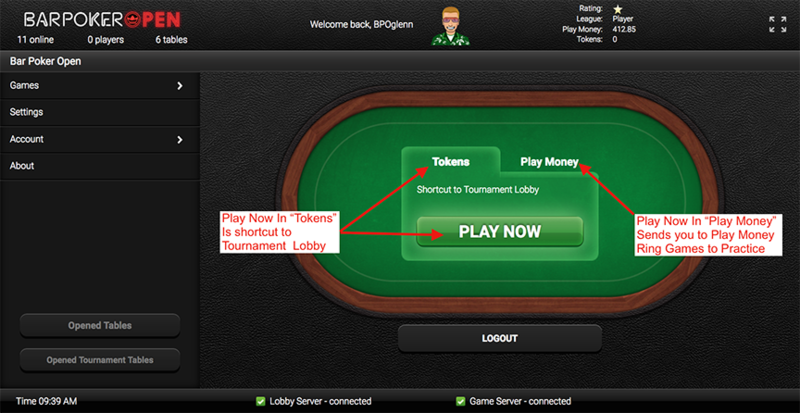 I tried to register with my token for Bar Poker Tournament on Sunday, April 1st and I couldn’t find a tournament. The instructions aren’t very clear for registering. No Tournaments came up for me except one that was played on Saturday, March 31st. There are very clear directions with screenshots of what the app looks like if you click on the blue “more info” button. I am looking for information and instructions on all the features of play. Are there ‘hot keys’ for my computer (so I don’t have to always move my cursor and then click on the buttons)? Is card-showing defaulted as ‘show’ or ‘hide’? How do I message other players? No ‘hot keys’ that we are aware of but you can use a tablet for touch screen. Default is to auto muck to keep action going and not slowing game down. You can use the chat box in the bottom right for any chatting with players. Is there another tournament later in the year like the one in June if you can’t make that one? Also, when is registration for the June tourney. There will be yes, but the weekly qualifiers are for June. If you can’t make June, just hold on to your tokens for the new season. I am the Black Rose Phantom! No, super league has no token entry, but only open to those that qualified. When will I receive confirmation of my seat in the Vegas tournament ? All seats won would display in your dashboard. There is also an RSVP coming out next week that will confirm your seat. They were emailed last week. If you didn’t see it just log into your dashboard you will see the RSVP notification there as well. I had question that I’m hoping you can answer. Is there a weekly “deadline” for tournament directors to enter in their respective tournament results? I’ve noticed on several occasions, depending on the venue and tournament director, that the results are not updated regularly. On one occasion, I didn’t see the leader board and token update for approximately two weeks after points were earned. This isn’t a huge deal, but when you’re contemplating a tournament because you’re borderline on a certain ranking tier, this can skew decision making. I can completely understand a brief delay since there are many, many tournaments and not everyone updates every day, but is there a specific rule governing when results should be uploaded? It’s possible I’ve overlooked this information and if so, I apologize. We would prefer if all results were entered the night they happen, but unfortunately some leagues do fall behind. I need a login for myself. I am contacting you under my husband’s name but I am the person playing the games. How can I get my name in the game? I was playing the tournament this morning I hit the rebuy button it disappeared but the clock keeps running to time me out I am ever disappointed that there is not a fail check or a confirmation of what you what to do!!!! What is included in the full apparel package for 2 seats? Any seats past second seat can be used as rebuys/add-ons in this Masters Tournament! Just head to a local bar hosting our events. Once you finish in the Top 3 at any event your league will register your account! Why is it so tough to register for Sundays tournament??? Where do I click on? I have tried and been successful some days, but not others. Very Frustrating!!! Sounds like you clicked on a setting that filters out the tournament. – “Show only registering” is never checked!